In my Influenster VoxBox, I received a mini candle to sample and review. Previously, I had no experience with White Barn merchandise but I have lots of experience with their sister scented company, Bath & Body Works. 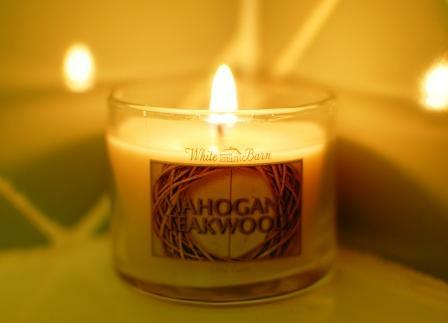 When I saw the name of the candle Mahogany Teakwood, I thought for sure it would smell woody and heavy. In fact, in my head, it was going to smell like patchouli. Why? I don't know, but I was pleasantly surprised. Instead, the fragrance is bright and warm. It actually smells to me like men's body products which is not a bad thing at all. I liked the product but find the price is too high. It's $3.50 for that mini candle which, as the name implies, is mini. According to White Barn candles, this tiny candle can burn for 15 hours. Not bad, but still not a good deal necessarily. Thank you Influenster for sending me a mini candle to sample and review. All opinions and green tile are my own.